Mud is a 2012 American coming-of-age drama film written and directed by Jeff Nichols. The film stars Matthew McConaughey, Tye Sheridan, Jacob Lofland, Sam Shepard, and Reese Witherspoon. The film competed for the Palme d'Or at the 2012 Cannes Film Festival. It was shown at the Sundance Film Festival in January 2013. The film opened on April 26, 2013 with a limited release in select theaters, before having a wide release on May 10, 2013. It performed well at the box office, grossing $32.6 million on a $10 million budget and received critical acclaim. Two 14-year-old boys in the De Witt, Arkansas area, Ellis (Tye Sheridan) and Neckbone (Jacob Lofland), have found a boat stuck high in a tree on a small island in the Mississippi River. They want to claim it for themselves but discover someone is living in it. They meet him, a strange man named Mud (Matthew McConaughey), who claims to have grown up nearby. He tells the boys that he needs food and promises to give them the boat if they help him while he stays on the island. The boys return with food and ask Mud why he is hiding out; he says he is waiting for his old girlfriend, Juniper (Reese Witherspoon), whom he describes as beautiful with bird tattoos on her hands. They later spot her grocery shopping in town. Ellis falls for an older high-school girl named May Pearl. Ellis learns from his father that his parents are heading for divorce. This threatens their old river houseboat. Once no longer used as a residence by the owner, it will be removed. Later, Ellis and his mother (Sarah Paulson) are stopped at a police roadblock. He then learns that Mud is a fugitive and tells the police that he has not seen that man. Ellis and Neckbone rush back to Mud and ask why the police are hunting him. Mud explains that he killed a man who had gotten Juniper pregnant and pushed her down a flight of stairs, causing her to lose the child. The boys decide to help Mud in exchange for his pistol. Mud sends Ellis to Tom Blankenship (Sam Shepard), an older father figure from his childhood, for help. Tom lives across the river from Ellis and agrees to come talk to Mud but is disturbed to hear that Mud is in trouble over Juniper again and refuses to help. After his plea for help is rejected by Tom, Mud gives the boys a note for Juniper. They find her motel room where another man (the brother of the man Mud killed) is abusing her. Ellis charges at the man but is quickly overpowered. Neckbone and Ellis tell Mud about the man. Mud realizes that the family of the man he killed has arrived to kill him. King Carver (Joe Don Baker), the father of the man Mud murdered, and his surviving son (Paul Sparks) with a handful of bounty hunters talk about staking out Juniper's motel and have paid off the local and state police. Stealing machine parts and an outboard motor from junkyards, the boys help Mud repair the boat. They also try to reunite Juniper with Mud, but she decides not to. Ellis suffers from heartbreak after May Pearl rejects him in front of her friends. Upon returning to the island, Ellis angrily calls Mud a liar, says he used the boys to do what he was afraid to do, and turned them into thieves. Running away, Ellis falls into a pit containing water moccasins and is bitten. Mud jumps in and rescues Ellis. Mud races to get the unconscious Ellis to hospital on the mainland. Recognizing Mud as the wanted man, one of the hospital employees calls the police who, in turn, tip off Carver. Mud manages to get back to the island where he and Neckbone get the repaired boat into the water. As they agreed before, Mud gives Neckbone a Colt .45 semi-automatic pistol but without ammunition. Mud wants to say good-bye to Ellis, so Neckbone takes him to the houseboat where he is recovering. While Mud is in Ellis' room, the Carver son and his posse arrive and start shooting. Tom fires his old sniper rifle, killing several attackers from across the river. Mud saves Ellis and tries to get away but is shot as he dives into the river. The police arrive and find all the posse members dead. One trooper calls King to tell him that his other son is now dead. Ellis's parents separate. He and his mother move to an apartment in town and their houseboat is demolished, while his father gets a new job far away, before telling Ellis to take care of his mother and departing. Ellis sees some attractive older teenage girls there and smiles. He is uncertain of Mud's fate, but still believes he was protecting Juniper. Mud is revealed to be alive and recovering on the repaired boat driven by Tom. Many days have passed, and the film ends with them looking ahead at the mouth of the Mississippi River, and south of that, the Gulf of Mexico. Jeff Nichols wrote and directed Mud, which was fully financed by Everest Entertainment and produced by Everest and FilmNation Entertainment. Nichols came up with the concept for the film in the 1990s. While still a student, Nichols began developing the story, inspired by Mark Twain's works, including the 1876 novel Tom Sawyer. He also sought to reflect the theme of love: "I wanted to capture a point in my life in high school when I had crushes on girls and it totally broke my heart and it was devastating. I wanted to try and bottle that excitement and that pain and that intensity of being in love and being a teenager." Nichols always had McConaughey in mind, after seeing him in Lone Star (1996). In May 2011, Chris Pine was first in talks for the lead role. McConaughey was cast as Mud the following August and was joined by Reese Witherspoon. Witherspoon was at the same agency as Nichols, so he was able to approach her for the role of Juniper. For the local boys of a small Delta town, Nichols cast boys who could already pilot boats and ride dirt bikes, instead of ones who would have to be taught on set. For the teenage role of Neckbone, over 2,000 boys auditioned, and 15-year-old Jacob Lofland from Yell County, Arkansas, was cast. Nichols started shooting Mud in his home state of Arkansas on September 26, 2011. Filming took eight weeks and concluded on November 19. He filmed in Southeast Arkansas; locations included Dumas (in the Arkansas Delta Lowlands area), De Witt, Lake Village (near the Mississippi River), Crocketts Bluff (on the White River), and Stuttgart. The island in the film was located in the Mississippi River outside the city of Eudora. The cast and crew numbered over 100 people, around half of whom were Arkansas residents. Over 400 locals were also involved as extras. According to the state government's Economic Development Commission, "Mud is the largest production ever to be filmed in the state." Nichols said about filming in parts of Southeast Arkansas, "These places and people have such a particular accent and culture, and they're quickly getting homogenized. I wanted to capture a snapshot of a place that probably won't be there forever." Mud's cinematographer Adam Stone used a Steadicam for filming. Stone, who was also cinematographer for Nichols's previous films Shotgun Stories and Take Shelter, said, "If you look at Shotgun Stories, the camera is fairly moored. With Take Shelter, we had a lot more dolly work. In Mud, the camera never really sits still. The locations were either super-remote or really small and cramped, so the Steadicam was the only thing that could get in there." The film was shot on Kodak VISION3 35mm film stocks in the anamorphic format with Panavision G-Series lenses. Mud premiered on May 26, 2012 at the 2012 Cannes Film Festival, where it had a competition slot for the festival's prizes including the Palme d'Or. Reuters reported that the film "[earned] warm applause at a press screening". Variety's film critics Justin Chang and Peter Debruge considered Mud one of their favorites of the film festival. Debruge said the film was reminiscent of the novel Huckleberry Finn: "It so elegantly addresses what masculinity and family really mean in the heartland." He said the Mississippi River in Mud was "a mythic backdrop... in which old values struggle against stronger modern forces in the world". British film critic Peter Bradshaw of The Guardian gave the film 3 out of 5 stars, stating that "Mud is an engaging and good-looking picture with two bright leading performances". After its Cannes premiere, no distributor immediately purchased rights to release the film in the United States. By August 2012, Lionsgate and Roadside Attractions acquired rights to distribute Mud in the United States. In January 2013, Mud screened at the 2013 Sundance Film Festival, and the Austin American-Statesman reported, "His modern take on Mark Twain played to an enthusiastic sold-out crowd of more than 500 people." The film opened in a limited release on April 26, 2013 in 363 theaters and grossed $2,215,891 with an average of $6,104 per theater and ranking #11 at the box office. The film then expanding on May 10, 2013 and grossed $2,538,599, with an average of $2,980 per theater, ranking #8 at the box office. The film ended up earning $21,590,086 in North America and $11,023,087 in other markets for a worldwide total of $32,613,173, against a $10 million budget. Mud received positive reviews from critics. On Rotten Tomatoes the film has an approval rating of 98% based on 171 reviews, with an average rating of 8/10. The site's critical consensus reads, "Bolstered by a strong performance from Matthew McConaughey in the title role, Mud offers an engaging Southern drama that manages to stay sweet and heartwarming without being sappy." On Metacritic the film has a score of 76 out of 100 based on 35 critics, indicating "generally favorable reviews". David Denby, writing in The New Yorker, praised the director, saying "Nichols has developed a talent for intimacy and for continuous tension—he could be developing into one of the great movie storytellers." He further notes that the film, as a whole, "plays with a depth and psychological acuteness almost never found in our movies anymore." Quoting The Wrap's report that the film played very strongly in the South, Godfrey Cheshire writes that he was not surprised, because "Mud is the best Southern film I’ve seen in ages." Singling out McConaughey's performance, The Village Voice described it as "the latest in McConaughey's campaign for reconsideration as a great American actor." Mud has received numerous awards and nominations. It received the Robert Altman Award at the 29th Independent Spirit Awards for its film director, casting director, and ensemble cast. The Independent Spirit Awards also nominated Jeff Nichols for Best Director. Tye Sheridan was nominated for the Critics' Choice Award for Best Young Actor/Actress. The film received the Grand Prix from the Belgian Film Critics Association. Mud was named one of the Top Ten Independent Films of 2013 by the National Board of Review. ^ "Mud (12A)". British Board of Film Classification. February 11, 2013. Retrieved June 16, 2013. ^ "In Motion With Arkansas Moviemaker Jeff Nichols". talkbusiness.net. July 15, 2012. Retrieved April 21, 2013. ^ "Mud (2013)". Box Office Mojo. Retrieved March 17, 2016. ^ "2012 Official Selection". Cannes. Retrieved April 19, 2012. ^ "Cannes Film Festival 2012 line-up announced". Timeout. Retrieved April 19, 2012. ^ Fox, Jesse David (January 16, 2013). "Mud Trailer: Matthew McConaughey and Reese Witherspoon Have a Southern-Accent-Off". Vulture. Retrieved January 16, 2013. ^ Tapley, Kristopher (January 16, 2013). "'Mud' trailer with Matthew McConaughey reignites the fuse in advance of Sundance bow". Hitflix. Retrieved January 16, 2013. ^ a b c McNary, Dave (August 16, 2012). "Lionsgate, Roadside warm 'Mud' for U.S.". Variety. ^ Jeff Labrecque (January 21, 2013). "Sundance 2013: The Rebirth of Matthew McConaughey". Entertainment Weekly. ^ a b c Leffler, Rebecca (May 26, 2012). "Cannes 2012: Jeff Nichols' 'Mud' Slides Into Competition with Matthew McConaughey, Reese Witherspoon". The Hollywood Reporter. ^ Zeitchik, Steven (May 15, 2011). "Cannes 2011: Cannes director and 'Memento' producer will collaborate on new film, possibly with Chris Pine". Los Angeles Times. ^ Abrams, Rachel; Sneider, Jeff (August 8, 2011). "Thesps wrestle in 'Mud'". Variety. ^ a b Zeitchik, Steven (May 26, 2012). 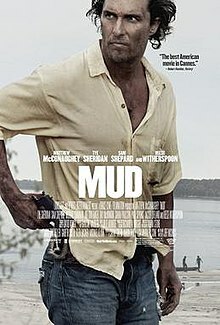 "Cannes 2012: Jeff Nichols cleans up with 'Mud'". Los Angeles Times. ^ Bell, Christopher (September 13, 2011). "'Take Shelter' Director Jeff Nichols Talks 'Mud,' Hopes To Have Michael Shannon In Supporting Role". The Playlist. indieWire. Retrieved February 6, 2013. ^ Millar, Lindsay (December 14, 2011). "Nichols talks 'Mud,' more". Arkansas Times. Retrieved February 6, 2013. ^ Debruge, Peter (February 14, 2012). "10 Cinematographers to Watch: Adam Stone". Variety. ^ "Getting Dirty: Mud embraces authenticity of locations". Kodak InCamera Magazine. November 9, 2012. Retrieved April 30, 2013. ^ Collett-White, Mike (May 26, 2012). "Cannes gets happy ending with river film 'Mud'". Reuters. ^ Chang, Justin; Debruge, Peter (May 29, 2012). "Cannes conclusions; Variety crix debate whether U.S. pics lived up to potential and what titles stood out at fest". Variety. ^ Peter Bradshaw (May 26, 2012). "Cannes 2012: Mud – review". The Guardian. ^ a b Odam, Matthew (January 24, 2013). "At Sundance: 'Mud' director no longer mired in acquisition angst". Austin American-Statesman. ^ "Mud (2013) – Box Office Mojo". Retrieved November 1, 2014. ^ Denby, David (May 1, 2013). "Life on the Mississippi". The New Yorker. Retrieved November 13, 2014. ^ Cheshire, Godfrey (June 10, 2013). "Why 'Mud' Is the Best Southern Film in Years". Indiewire. American Film Institute. Retrieved November 13, 2014. ^ Scherstuhl, Alan (April 25, 2013). "Matthew McConaughey Shapes Mud Into Man". The Village Voice. Retrieved November 13, 2014. ^ "Spirit Awards Nominees Are Announced! Excitement Ensues". Film Independent. November 27, 2013. Retrieved November 27, 2013. ^ "National Board of Review Announces 2013 Award Winners" (Press release). New York, NY: National Board of Review. December 4, 2013. Retrieved September 18, 2017. This page was last edited on 23 April 2019, at 12:28 (UTC).